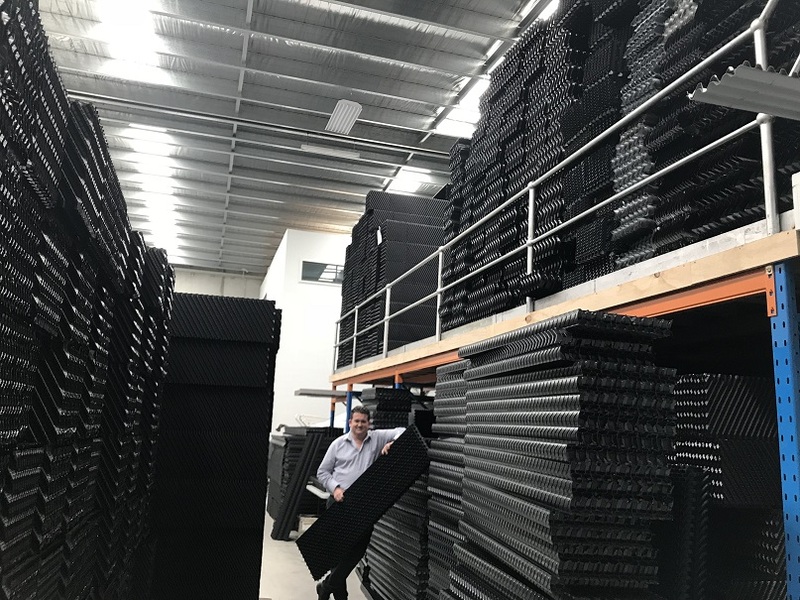 Coolclean holds a range of cooling tower parts at our factory in Hallam Vic. We import the parts direct from manufacturers, at the ready in Victoria for fast delivery Australia-wide. While we supply a range of spare parts brands, we recommend Brentwood parts due to their quality engineering and exceptional longevity. All materials are compliant with Australian Standards. Replacement parts can also be retrofitted to suit your system. 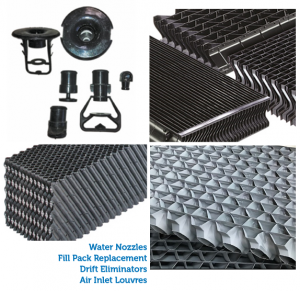 Parts for all cooling towers, including Aggreko, Aquacool, BAC, Baltimore Air Coil, Budge Ellis, Coolboy, Coolmaster, Davenport, Evapco, F Muller, Fibreflow, Fibre Tech, Gatorade, Hamon, Hydrothermal, Lakeside, Linear, Marley, Maxichill, Messan, Muller, Radic, Shinwa, Sulzer, Superchill, Temcel, Thermfresh, Tower Thermal. Trade discounts apply – contact us for pricing. We recommend Brentwood PVC cooling tower components primarily due to their exceptional longevity and safety. They ensure strength, durability and outstanding performance. Modular and adaptable to all cooling tower makes and models. Brentwood components are UV stabilised. They are largely resistant to weather exposure, making them ideal Australia’s often extreme conditions. Resistance to chemical degradation from acids, alkali, fats, greases, oils, and biological factors – for a longer lifespan, reducing maintenance and repair costs. We recommend PVC as it presents a lower fire risk – particularly in the case of Brentwood whose components have self-extinguishing characteristics. PVC’s excellent fire rating means that it is safer for people to perform ‘hot work’ in the vicinity, such as grinding and welding. 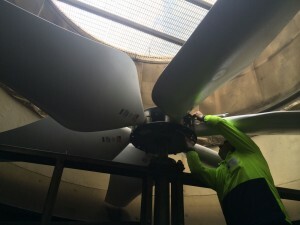 We supply and install a complete range of cooling tower mechanical parts, including fans, motors, shafts, impellers, cowls and coils. A critical but frequently overlooked component is the ball float valve, because if it becomes damaged, cooling units can overflow or run dry. Our technicians carry ball float valves among spares in their vehicles. Coolclean also supplies all consumables, including nozzles, grommets, seals and strainers – which require frequent replacement.